Well, it’s that time again! I’m about to travel for 2 weeks on another trip for work! Many people found my tech travel bag article useful, so I figure I’d do it one more time for my regular travel bag. Samsonite Hard Luggage – If you travel more than a couple of times, its time to invest in a hard bag instead of the soft ones. These ones I got from Costco are built like tanks and have made it through over a dozen trips so far with only some small scratches on the surface! The ones I got at Costco are no longer there, as they constantly rotate, but I linked the closest ones I could find on Amazon. I used the soft ones for the longest time, as I liked having the zip pouches on the outside, as as well as a preferred layout of one giant cavern versus two halves. But after a few trips, they were already degrading, and were just not up to the task of constant travel. Harry’s Razor Dopp Kit – I love their razors so I picked up this Dopp kit bag to check it out. I love it as its very durable and has a soft but thick lining on the inside that can be cleaned. I had the misfortune of once having an item in my bag burst, but I was able to wash it out entirely, free to use it on my travels once again! White Noise Generator – You never know what the noise levels will be like when you are on the road. Most of the time I haven’t had a problem but on occasion you’ll have loud stomping people above or loud hallway people or neighbors. This allows me to shut it all off when its time to go to sleep and not have to stress out at all when I am on the road about noise. What I like about this particular model is the fact that it’s using a motor inside to generate the white noise, so its always random. I can’t use most audio ones as eventually I find the loop point and that’s all I can focus on. Shoe Cover – This allows me to bring my workout shoes with me, without worrying about them dirtying up my clothes or vice versa. If you need to bring another pair of shoes with you, it’s worth the few dollars to get these. The one I’m using came with a pair of shoes I bought, but I linked some low cost ones on amazon. Finally, an item I always thought was silly until I used them for the first time this trip….. Packing Cubes! – Oh my god! 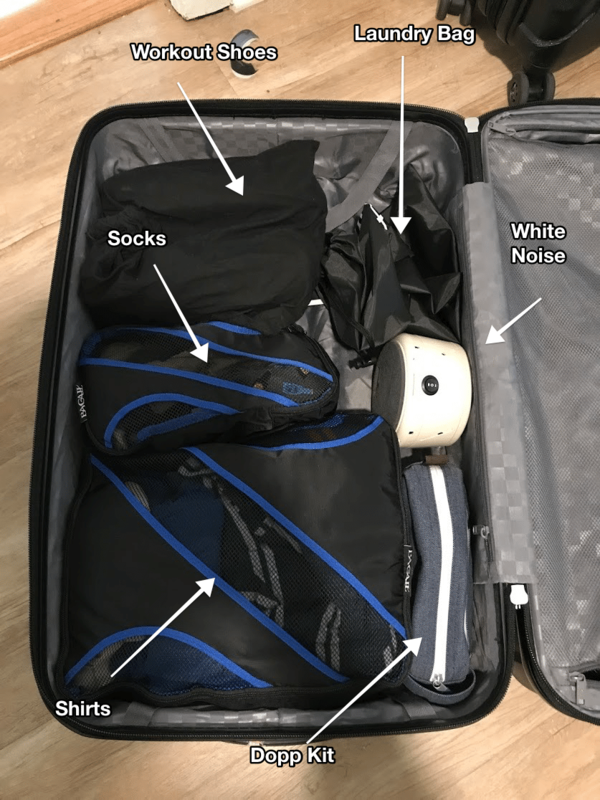 This makes travel packing SO much easier! I just use a cube for each of my items (Shirts, Jeans, Underwear, Socks) and they’re all organized and ready to go. No merging of stuffs in the bag or going mining in my bag for a specific item. I can pull them out with ease. This set also includes a laundry bag, so I can just throw all the nasties in here when I’m done! 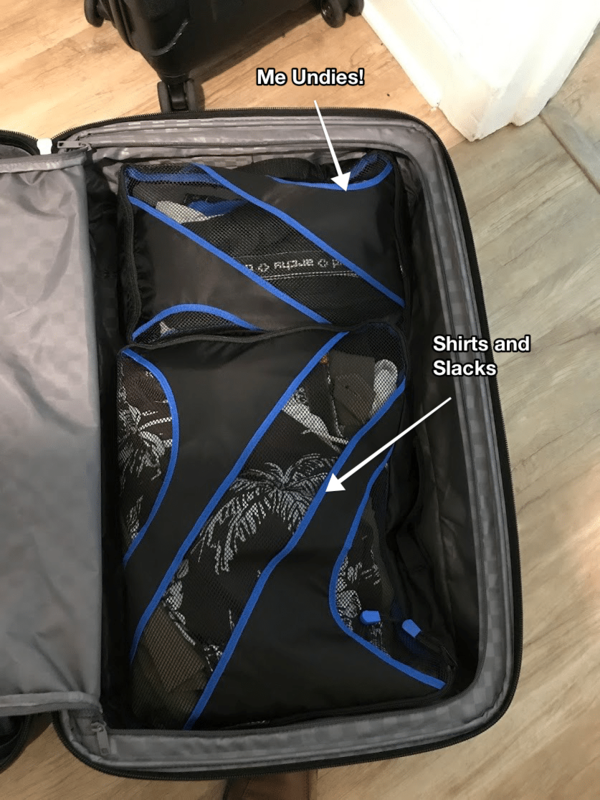 As silly as packing cubes can seem, they are worth their weight in gold! Do you think my apartment is this organized? Hell no! But now I feel all neat and tidy on the road! I have to thank The Mad Fientist’s article for pointing these out to me! May this help you on your next journey though the skies!